Chester Football Club – Official Website » BREAKING | Four more names confirmed for Offside Trust Celebrity Fundraising Match! 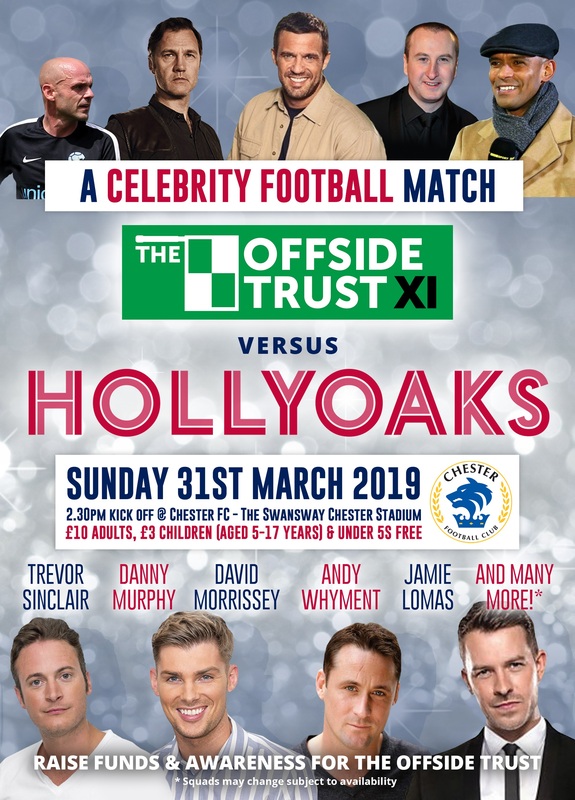 We are delighted that four more big celebrity names have joined up for the Offiside Trust XI vs Hollyoaks XI Celebrity Fundraising Match at the Swansway in March. Tattoo Fixer Jay Hutton will link up with former footballers Lee Trundle and Gary Taylor-Fletcher. Social media personality Benny James will also feature. The Offside Trust XI will be Managed by the Blues Joint Bosses Anthony Johnson and Bernard Morley. The game takes place on Sunday 31st March. The Blues Joint bosses have agreed to take charge of a team that already contains Trevor Sinclair and Danny Murphy and actors David Morrissey and Jamie Lomas! Their opponents, The Hollyoaks XI, features the likes of Gary Lucy, Nick Pickard and Kieron Richardson! Kick off is 2.30pm at the end of March, with funds and awareness being raised for the incredible work the Offside Trust do. Chester FC and Chester FC Community Trust are proud to support the work of the Offside Trust and we look forward to seeing you at the end of March attending this game to support a worthy cause; and an exciting opportunity to see some stars!